As warmer weather approaches, men and women alike will start showing more skin. And what better way to beautify that skin than with an artistic temporary tattoo? 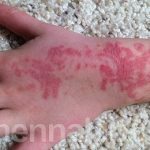 But beauty can be an ugly business: The Food and Drug Administration is now warning that some temporary tattoos marketed as “black henna” tattoos contain a potentially dangerous ingredient called p-phenylenediamine or PPD. Unlike natural henna, a harmless reddish-brown extract from a flowering plant, PPD is derived from coal tar. Varying amounts of PPD may be found in black henna ink, depending on the tattoo parlor. Some parlors use pure PPD; others mix it with natural henna or other compounds. The ink is then painted or airbrushed onto skin. “You may see ‘black henna’ used in places such as temporary tattoo kiosks at beaches, boardwalks and other holiday destinations, as well as in some ethnic or specialty shops,” FDA spokeswoman Tamara Ward told NBC News. “Depending on where you are, though, it’s possible no one is checking to make sure the artist is following safe practices or even knows what may be harmful to consumers,” Ward said. Adding PPD to tattoo ink makes the tattoo darker and longer-lasting, but for some people, the impression may last a lifetime. PPD can cause skin reactions, including “redness, blisters, raised red weeping lesions, loss of pigmentation, increased sensitivity to sunlight and even permanent scarring,” according to an FDA news release. “Just because a tattoo is temporary it doesn’t mean that it is risk-free,” said Dr. Linda Katz, director of the FDA’s Office of Cosmetics and Colors. Skin reactions among some people can occur almost immediately, or up to three weeks after application. Another parent told the FDA her teenage daughter’s back looked “the way a burn victim looks, all blistered and raw” after getting a black henna tattoo. According to her daughter’s doctor, the teenager will have scars on her back for life. Regret is a growing phenomenon among people who get permanent tattoos, too. According to the American Academy of Dermatology, 17 percent of those who get tattoos consider getting them removed.